Sorry that I haven't written for awhile! It's been kind of hectic lately since my calendar was filled up with lods of clients and great happenings. I just love this time of the year when (the loooong November is finally over) I can start preparations for Christmas. Since Christmas is my favorite holiday. I got to spend Thanksgiving in Savannah, GA, at a sunshine and with one of my best friend and her family. She will be starting to do same kind of treatments than I do in Florida in the near future. She just needs to finish her school to get licensed and then there is two of us! Past couple of weeks the weather has been the best! Yes, I do wish white Christmas, but not here. Let it snow in Finland, it is very much needed there. http://jouluradio.fi .That is a radio station which only plays Christmas carols 24/7 the whole December. All in Finnish! I have been in 2 awesome concerts and there is one more to come! The first two were special since my daughter was performing. 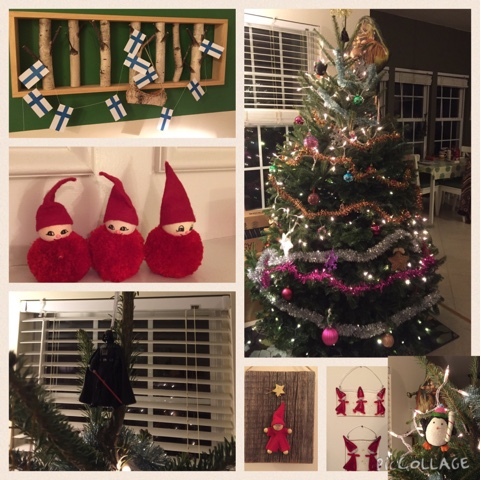 We are going to have Pikkujoulu (=Little Christmas) with my best girls and their families this Saturday! Pikkujoulu is celebration with your friends or collegues before the real Christmas, that is more a family thing. I get to bake Finnish goodies & pastries and serve some glögi! I can make my own traditions. My front yard has a plenty of lights and even a figure and my daughter thinks I've gotten crazy. I'd never ever done that in Finland. We have also had Christmas tree decorated for almost two weeks at this point, even though I know that is's supposed to do only at Christmas Eve morning (or the evening before that) in my original way. This year is super-special since my dear and oldest friend (we have 42 years of history) is arriving to Charlotte in 5 days, 23 hours and 17 minutes... who's counting? Santa will come to our house on Christmas Eve! No climbing in chimney, but ring the doorbell and we'll be singing him before he hands out the gifts (if we have been good enough to get any). I am so much looking for the New Year! Meanwhile I wish that You can enjoy your life, meet some family and eat good food and prepare Yourself: 2016 will be the best year so far. I am so happy to meet new challenges with all of You. I am on holiday pretty much 12/21-1/3.